A powerful Democrat in Congress says regulators should consider shutting down Wells Fargo for abusing the trust of millions of its customers. Maxine Waters, the top Democrat on the House Financial Services Committee, issued a 38-page report on Friday slamming regulators for failing to punish the bank more severely for its recent scandals. The report, prepared by the Democratic staff of the committee, described Wells Fargo as a "repeat offender" for, among other things, opening as many as 3.5 million potentially fake accounts, forcing up to 570,000 borrowers into unneeded auto insurance and allegedly discriminating in mortgage lending. "When a megabank has engaged in a pattern of extensive violations of law that harms millions of consumers, like Wells Fargo has," the report said, "it should not be allowed to continue to operate within our nation's banking system." Wells Fargo is highly unlikely to lose the banking charter that allows it to operate, analysts said, partly because of the enormous complexity involved in shutting down a big bank the size of this. Wells Fargo has 70 million customers and 271,000 employees. But the fact that this argument is even being made shows how much political pressure Wells Fargo is under as it prepares for a Senate hearing on Tuesday. Wells Fargo declined to comment, but the bank has repeatedly apologized for making mistakes that hurt customers. Wells Fargo was fined $185 million by regulators last year as part of a settlement over the fake accounts. But Waters says fines are ineffective with big banks like Wells Fargo because they are ultimately paid by shareholders, not the executives who preside over bad behavior. The report argues that regulators should have considered harsher penalties: shutting down problem areas of Wells Fargo, removing executives and directors, banning personnel from working in the industry, revoking the bank's national charter, or even winding down the bank entirely. "These underutilized authorities should be, but have not been in the case of Wells Fargo, exercised in order to adequately combat rampant, illicit activity by a bank," the report said. It added that Congress should consider passing laws that would require forcing regulators to use these aggressive punishments. 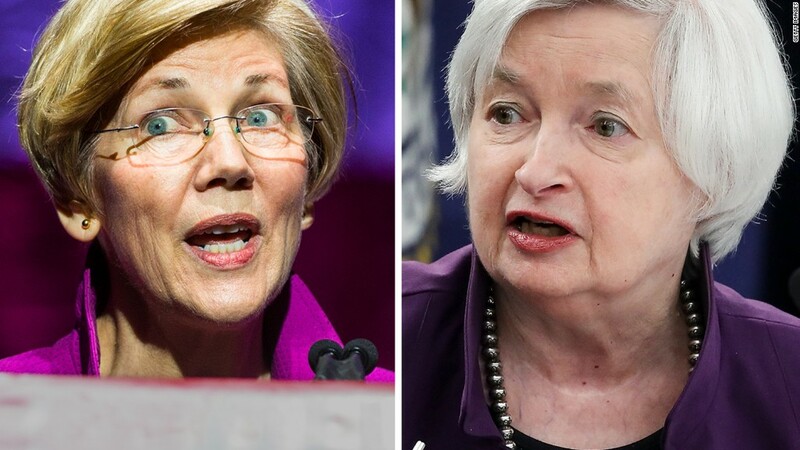 Senator Elizabeth Warren has repeatedly urged the Federal Reserve to exercise its power to remove most of Wells Fargo's board for providing poor oversight. Fed chief Janet Yellen recently called Wells Fargo's behavior "egregious and unacceptable" and said the central bank is considering whether more punishments are needed. Jaret Seiberg, senior policy analyst at Cowen Washington Research Group, said the Waters report will keep pressure on the Fed to crack down on Wells Fargo management and the board. "We do not see any risk to the ability of Wells Fargo to be a bank," Seiberg wrote in a report. "This is really just about whether management can survive." Seiberg warned that if Democrats took over Congress, the Wells Fargo controversy "could quickly escalate into a much bigger fight over the bank's future." Wells Fargo (WFC) CEO Tim Sloan, who took over a year ago during the scandal, faces a huge test on Tuesday when he is scheduled to appear before Warren and her colleagues on the Senate Banking Committee. Sloan plans to emphasize the progress Wells Fargo has made to fix its broken sales culture. "The past year has been humbling and challenging," the Wells Fargo CEO said in prepared remarks provided by the bank on Monday. "We are resolving past problems even as we make changes to ensure nothing like this happens again at Wells Fargo." Over the past year, Wells Fargo has taken a series of steps aimed at restoring trust with customers and reassuring regulators. It replaced longtime CEO John Stumpf, revamped its unrealistic sales goals, tapped former Fed official Betsy Duke as chairman, fired numerous bank managers for sales problems, and reached a $142 million class action settlement with customers.